For all your real estate needs, call Sandy Lovell, with Century 21 Classic Real Estate. Your neighborhood specialist and REALTOR who knows your community. Let Sandy, an award winning, top producing agent with a proven track record, bring you home! "Don't call me if you want your home listed, call me if you want it SOLD!" REAL TIME SEARCH OF CURRENT HOMES FOR SALE - Click on the Images below and it will take you to the public portal of our 2 local MLS Systems. Follow the instructions they provide and let me know if you have any questions. SEARCHING MADE EASY! There are several residential building lots for sale in Caroline Pines. Most of these lots are owned by the Caroline Pines Property Owners Association, except for the waterfront Lot 510 Longleaf Road, which is privately owned. 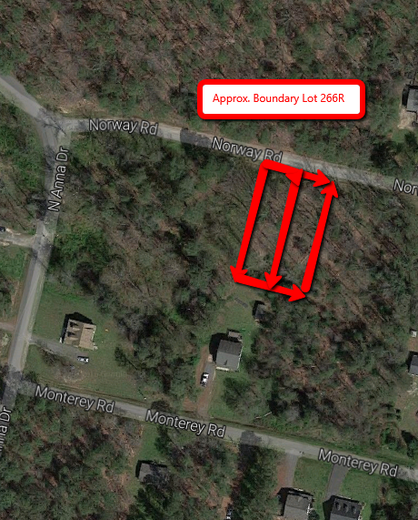 All lots are wooded and would have to be cleared by the buyer before building. There is no time requirement to build when a lot is purchased. However, once a permit is issued by the county, building must be completed within 18 months. For the lots owned by Caroline Pines Property Owners Association​ ("CPPOA"), Lot prices are either $1,500 or $2,500 as listed below. Some are combined lots (two lots side by side that are now one lot). The list prices on the Caroline Pines lots are NET to Seller. Buyer must pay Seller's closing costs, current taxes to date and fees to include, but not limited to title services, deed preparation, Grantor's tax, and a 10% sales commission. (no back taxes or back HOA dues owed). These fees generally do not exceed $700. Buyer's closing costs, excluding pro-rated HOA dues, are approximately $1,500. Current HOA dues are $1,049 per year. Caroline Pines water is serviced by Caroline County Public Utilities at 804-633-4390. The current cost to connect to the water system is $8,000. Call a septic company to determine the costs to install the required septic system. Dwellings cannot be any smaller than 900 s.f. base and no single-wide mobile homes are allowed. All dwellings must be on a permanent foundation. Feel free to inspect these lots in person at your convenience -no gated entrance into subdivision. Lots are not marked. There are no "for sale" signs on these lots. Use the information below to find the general location. Look under the Homeowners Association page to find the Building Permit Guidelines, Building Permit Application, Rules and Regulations of the subdivision (Aug 2017) and the subdivision Restrictions. ​Please call Sandy Lovell, REALTOR at 703-861-6205 if you have any additional questions or would like to make a purchase.